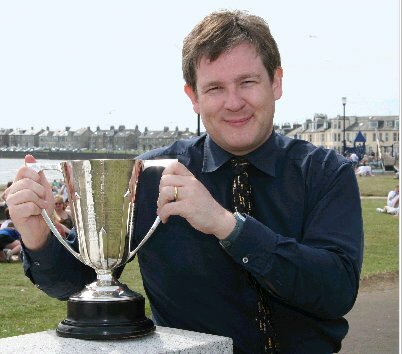 Jonathan Grant of Edinburgh West is the 2006 Scottish Champion. Brilliant. The Scottish title is back in the capital city. Jonathan's wife, Ketevan! She shared the title with Paul Motwani in 2003. Winning this title has been an ambition of Jonathan's. make him a worthy Champion. He played solid chess devoid of any noticeable blunders. (1 dodgy looking move - see below). simple tactics in the middles game. Jonathan set his opponents problems they failed to solve over the board. Here are what I consider the critical positions from all his games. are going to be this hard then he has a tough week ahead. although a piece down I'm pretty sure this is a draw. a draw. I drew such a ending v Paul Lamont about 20 years ago. a draw but the defender has to know what they are doing. "If they do not know the drawing idea then they will lose. They will never find it over the board." - Keith Ruxton. This type of ending is not all that uncommon. two Bishops or a Bishop and a Knight. winning/defending ideas. I'm not going to give it here. This is Chandler Cornered for heavens sake. Endings - Blah! In the position you will note that White has a pawn. it go and concentrate on the draw then he may have drawn the game. Neil Mcfarlane scouring the rule book to see how many moves were allowed. to one if the pawn moves or is taken). ran his King across to the edge of the board to defend it. 69...Be6+ 70 Kf8 Rh7 1-0. ...Black played 39...Rec5? and White took the Bishop on a4. and I think Jonathan would have won even without the blunder. chose the wrong end game plan. to occupy f6. So the move to draw was 68 Kc7! You can see the route for White. c7-d7-e7 & f6. the key square f6. White is now lost. 68...Ke5. A few moves later this position was reached (Black to play). in 3 moves. White is too far away from the f-pawn. The Black King shepherds home the passed pawn. I'm surprised at myself for finding this. It is after all an ending and I'm Geoff Chandler. Keith Ruxton, Eddie Perry and Neil Berry show in Sandy Bells. position, he launched a do-or-die attack. error was fatal. (time trouble again?). or 35...c5 to cover the threat of 36 Bd4. No. Not at all. To win any game your opponent must blunder. Jacob Gunnar blundered and lost. some pressure so he rolled the dice. 13...c6. I spent quite a while trying to see what he had in mind with 13...c6. 14.Qxd6 Rd8 15.Qa3 Rd2 16.Rad1. Black & White saw in this position. during the whole Championship campaign. I cannot see anything concrete for Black after 25 Kh2. seized the day. This was the hallmark of Jonathan's play. If his opponent played a lemon then he jumped upon it. I cannot find a trick missed in his games. Black got himself into difficulties in the opening. he sacced the exchange to get rid of a huge Knight on d5. down an open e-file he grabbed a pawn as compensation. Black played 25...Nxb4? 26 Qe1+ and the Knight was gone. Black resigned a few moves later. Here is the full game. This was the one game Jonathan lost. always runs the risk of stepping into a prepared line. 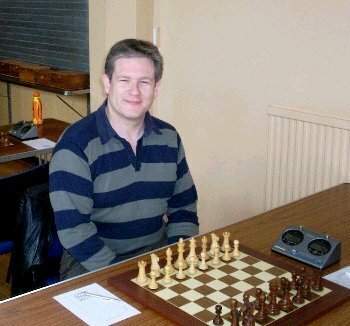 Andrew Muir in his three other whites played 1.d4. to obtain a very nice position from the opening. I smell a prepared line. I may be wrong. would have taken a 2 point lead over his nearest challenger. when Andrew flicked out 1.e4. I would have played 1 d5. into the mainline Caro Khan. It may have upset Andrew's opening strategy. Let us have a look at the game. with a very difficult game ahead of him. one of the two Bishops at the cost of his pawn structure. squares available in the heart of Black's position. into the broken King-side with f4 and f5. The end after the move 40 Kg2 was never really in any doubt. an uneven amount of players (9) in the Scottish Championship. was ½ a point to secure the title. This was gained without drama. 1.c4 c6 2.Nc3 d5 3.d4 Nf6 4.e3 e6 5.Nf3 Nbd7 6.Qc2 Bd6 7.Bd3 draw agreed. 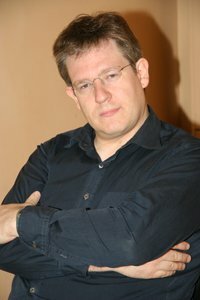 The first two pictures also came from the Chess Scotland site. on round two. Here is my train ticket.